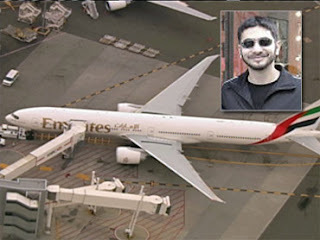 Maggie's Notebook: Eric Holder Lies: UAE Notifies US of Shahzad on Flight? I listened as Attorney General Eric Holder gave a press conference on the arrest of the Times Square car bomber wanna-be, not long after midnight Tuesday. He said Faisal Shahzad was apprehended in the airport, trying to get aboard a flight out of the country. This morning I read that Shahzad was actually aboard a United Emirates flight bound for Dubai, and the flight had already taxied, but returned to the gate. Do we really think Holder did not know Shahzad had made it onto the flight and the flight had taxied? I can't believe that. There is a huge effort by the Obama administration underway to tell us they were on top of this guy trying to flee, but Rush is saying that United Arab Emirates Airlines called U.S. authorities and told them Shahzad had just purchased a one-way ticket with cash. CBS News is verifying this report. If the flight had taxied, it is apparent that we almost didn't get to Shahzad before the flight left the runway. There is no doubt the flight would have been called back, but the coverup of this administration is disgraceful.